Tea is an important part of Hong Kong culture, given its shared history of Chinese and British rule and customs. Both cultures have long espoused tea as formal social engagement, and it plays significant role in traditions and interactions. But I'm sure neither the British nor Chinese would expect a tea party to be quite so wild and fantastical as the Alice in Wonderland themed attraction at Hong Kong Disneyland. Under a soaring tent-shaped canopy structure, the Mad Hatter Tea Cups present swirls and patterns of lovely pinks and lavenders and turquoise and oranges, and they combine into quite a delectable palette. I suppose you can always make new traditions. 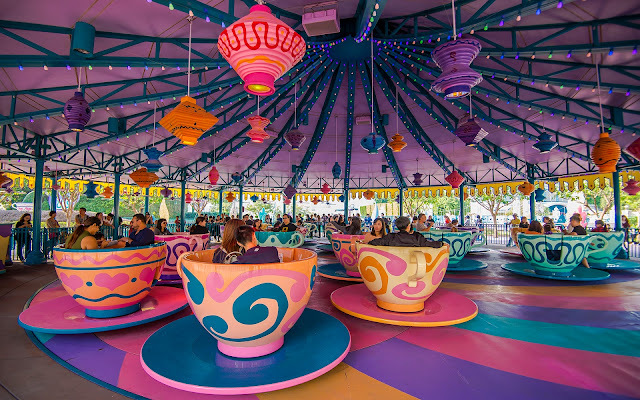 Lively pastels paint the teacups and interiors of the Mad Hatter Tea Cups in Hong Kong Disneyland.